For many years the Michigan Community Foundations’ Youth Project [MCFYP] and the Giving Indiana Funds for Tomorrow [GIFT] initiative were the only two projects of their kind. The programs had a statewide vision for community foundation service, had similar values regarding honoring local donors and community leaders, and were engaged in hands-on, in-the-community technical assistance and training. For these reasons, there developed a very close working relationship between the staff of MCFYP and of GIFT — shared resources, mutual support and idea sharing, joint publications and training, were all part of the close relationship. Ms. Helen Monroe has a long-time and national perspective on community philanthropy. She knows the Michigan foundation leaders and has worked closely with Michigan professionals for many years. Ms. Helen Monroe talks about her career in philanthropy. Ms. Helen Monroe talks about the development of the Giving Indiana Funds for Tomorrow (GIFT) program. Ms. Helen Monroe talks about developing community foundations across the country. Ms. Helen Monroe talks about how philanthropic leaders act modest and selfless. Ms. Helen Monroe graduated from Chatham College in Pittsburgh, Pennsylvania with a Bachelor of Arts in art and French in 1963. She earned a lifetime teaching credential at University of California at Berkley in 1965. Ms. Monroe’s first introduction to philanthropy came from watching her parents consistently engage with the community as volunteers. Whether it was sewing layettes for local kids or supporting the war effort by bottling blood, her parents were strong examples of the importance of volunteering and giving what one could. Ms. Monroe began volunteering at a local hospital during summer breaks in junior high with a group of friends. She continued this practice in college, giving of her time as a Sunday school teacher, and facilitating story time at the local library. Ms. Monroe began her career in the sector serving as executive director of the San Diego Community Foundation. During her ten years as CEO, she increased the foundation’s assets from $1.5 million to $75 million. While working at the San Diego Community Foundation, Ms. Monroe was invited by the Lilly Endowment to submit a proposal to nationally promote an endowment building workshop that she had developed. With the help of the Lilly Endowment, she brought this workshop to the National Community Foundation Conference for three years. In the fall of 1989, Ms. Monroe began new discussions with the Lilly Endowment about how to better support Indiana community foundations. As a result, Ms. Monroe developed the community foundation training and support system that would become known as the Lilly Endowment’s Giving Indiana Funds for Tomorrow initiative. “ … We had initially thought 20 [community] foundations would be a huge success, [but we] had 20 active starts within six months of the launch of the first announcement. That led us to believe that there was much more interest and potential around the state,” said Ms. Monroe. To date, the Lilly GIFT initiative has helped develop over 90 community foundations in Indiana, and has become a model used across America in encouraging the growth of community foundations. 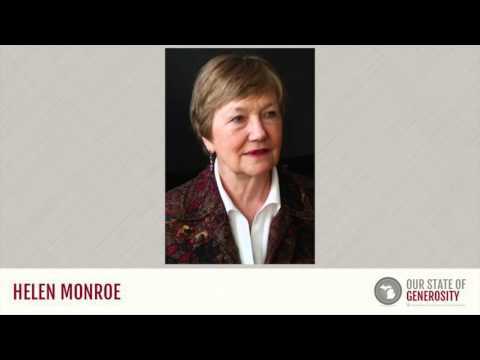 In 1991, Ms. Monroe founded the Endowment Development Institute (EDI), a management consulting firm that specializes in helping philanthropic organizations with building endowments, creating strategic plans, improving management practices, and fundraising. Ms. Monroe’s work through EDI has helped develop many nationally recognized philanthropic organizations including the Ford Foundation’s Rural Poverty initiative, the Center on Philanthropy at Indiana University, California State University at San Marcos, the Peter Kiewit Foundation, the Kansas Health Foundation, and the Walton Family Charitable Support Organization. In addition to her national work in the field, Ms. Monroe has worked with community foundations in Britain, Poland, Canada, and Mexico. She started the Pacific American Community Foundation (now the International Community Foundation) in 1991, which is committed to fostering lasting philanthropy in Mexico and Latin America by connecting U.S. donors interested in international giving with local community needs. Ms. Monroe continues to speak nationally at conferences, sharing her insight and experience on community foundation growth. Additionally, she still works with both the GIFT initiative and EDI. Ms. Monroe was interviewed regarding her insights and experiences in working with Michigan’s philanthropic community and the Our State of Generosity (OSoG) partners. The following are selected quotations from her interview specifically related to the five organizing themes of the OSoG project.